Fine Quality Jewelry For Less! 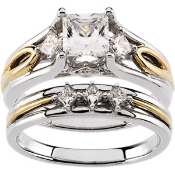 You are getting an exquisite Princess Cut Diamond Engagement Ring and a matching Diamond Wedding Band. The egagement ring contains 1 3/8ctw and wedding band 1/6 ctw. * Select 6 6 1/2 7 7 1/2 8 8 1/2 9 9 1/2 10 10 1/2 11 Larger than 11 Please Call! Copyright © 2010-2019 JM JEWELRY. All rights reserved.